KR-274 Ruler reticle 0.350" in 100 divisions with crossline, numbered 0 through 100. 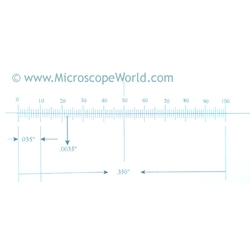 Learn how to make accurate measurements when using your reticle here and learn about calibrating your microscope here. Reticle is available in a number of different diameters, select below when ordering.